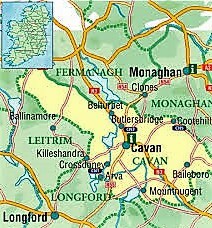 As befits both their Norman ancestry and their country of settlement, most Irish Nugents were Catholics. The Antigua branch, being on the losing (Catholic) side at the Battle of the Boyne (1690) migrated to the Caribbean where Walter Nugent married the daughter of a French Hugenot trader and became a Protestant. Some Irish Catholics also converted to Protestantism. One such is Major General Sir Oliver Nugent KCB, DSO, a hero of the First World War who played a role in the early communal politics of Northern Ireland. Oliver Nugent, the son of Major General St George Nugent and Emily, daughter of the Right Honourable Edward Litton, a senior Irish judge and Westminster MP, was born in 1860. He was educated at Harrow and Sandhurst, joining the Royal Munster Fusiliers in July 1882, transferring in April 1883 to the King’s Royal Rifle Corps. He served on the North West Frontier of India in the Hazara, Chitral and Miranzai expeditions, was twice ‘mentioned in dispatches’ and awarded the Distinguished Service Order (DSO). Nugent later served in the Second Boer War where he was wounded and taken prisoner at the battle of Talana Hill. Doctors were unable to remove a bullet lodged close to his spine which caused him pain for the rest of his life. 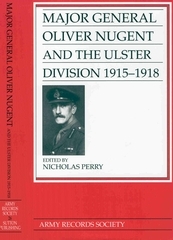 After subsequent postings in Ireland and England, he was promoted to the rank of Colonel and served as ADC to King Edward VI and King George V.
In 1915 Oliver Nugent was given command on the Western Front, firstly with the 41st Infantry Brigade and then, in September 1915, with the 36th (Ulster) Division with whom he served until 1918. He was promoted to Major-General in January 1916. His 36th (Ulster) Division took heavy losses at the Battle of the Somme. 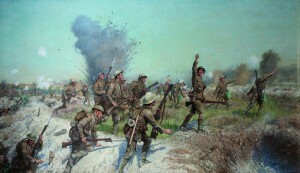 The battle of Messines (June 1917), though costly in lives, was considered a triumph for the allies. Spanbroekmolen mine is said to have caused tea-cups to rattle in London and was largest man-made explosion until atomic bombs arrived. This key First World War battle was commemorated in 2017, exactly a hundred years after its start, when the Duke of Cambridge and the Irish Taoiseach with politicians from both sides of the Irish border met at the ‘Island of Ireland Peace Park’ in Flanders. It is reckoned that a total of 32,000 men of the Ulster Division were killed,, wounded or went missing during the war. Gardiner Humphreys, the son of a prosperous London solicitor with Anglo-Welsh roots, had married Emily, daughter of the 10th Earl of Westmeath, the senior figure in the Nugent family. As a young Captain in the Royal Horse Artillery in the Second Boer War, Humphreys was involved in a short but epic encounter with the Boers outside Bloemfontein which led to the extremely rare gallantry award of a collective Victoria Cross. Humphreys was also awarded the DSO. 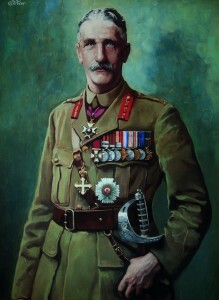 Humphreys was promoted to Brigadier-General in command of one of three corps recruited from different parts of Ireland responsible for the attack at Messines, under the overall command of General Sir Herbert Plumer. Given the volatile state of Irish politics in 1917, Oliver Nugent’s command was rich with political overtones, The 36th (Ulster) Division had recruited from the nascent Ulster Volunteer Force (UVF). This politicisation of Irish civic-military relations was resented by Oliver Nugent, leading to vituperative exchanges between him and factions of the UVF as well as with politicians in Belfast City Hall. It is not clear whether it was Oliver Nugent or General Plumer who suggested that the two Irish divisions should line up beside one another, but there was a clear attempt to make a statement against the partisan politics over the question of Home Rule for Ireland, while there is no record of discord between the two divisions. Nugent’s family seat was at Mount Nugent in County Cavan, technically a part of Ulster which on Home Rule remained with the Republic. Ironically, Oliver Nugent had helped found the UVF with his friend and neighbour, Lord Farnham, but he turned away in disgust, seeing his idea of a force merely to maintain peace and security being compromised by political agitation. Retrospectively, Oliver Nugent felt profoundly uncomfortable with his involvement in the UVF, believing that he had compromised his professional standing, stating that he ‘disagreed all along on the policy which created the UVF’ and that ‘the physical force movement was a mistake and the arming of Ulster still a greater mistake’. Oliver Nugent’s unease over this episode deepened an innate distrust of politicians which became evident during the war. One who took against Oliver Nugent was Field Marshal Sir Douglas Haig, commander of the British forces on the Western Front, with the result that Oliver Nugent did not receive the expected knighthood by the end of the war for his efforts. This was rectified in 1922 by Field Marshal Sir Henry Wilson, then Chief of Imperial General Staff and another Ulsterman, who had appreciated Oliver Nugent’s wartime efforts. Later that year Wilson was assassinated by IRA gunmen on his own doorstep. 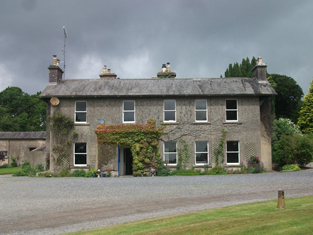 The seat of the Nugent family of Ulster since the late seventeenth century, Farren Connell occupies the site of an earlier house, the Manor of Carrick. The estate of Major-General Sir Oliver Nugent, distinguished commander of the 36th (Ulster) Division during the First World War, notably at the Battle of the Somme, remains in the hands of Nugent descendants to the present and has played a significant role in the local economy. Oliver Nugent’s family were a cadet branch of the Nugent’s, having resided at Farren Connell, colloquially known as ‘Bobsgrove’, in county Cavan, from the seventeenth century to the present day. After the First World War, Oliver Nugent farmed at Farren Connell with his wife Kitty while also working tirelessly for the welfare of ex-soldiers and being much involved in the building of the Ulster Memorial Tower in Thiepval, France. On his death and burial at Mount Nugent, a service was held in Belfast’s St Anne’s Cathedral which hundreds of 36th (Ulster) veterans attended. It was shunned by senior politicians. However, Oliver Nugent had the ‘final say’ over those curmudgeonly politicians. Today his portrait hangs in Belfast City Hall while his medals are on display. Among them, a silver medal was given by Pope Benedict 15th during the First World War as thanks to Oliver Nugent for punishing soldiers who had ransacked several churches in France.